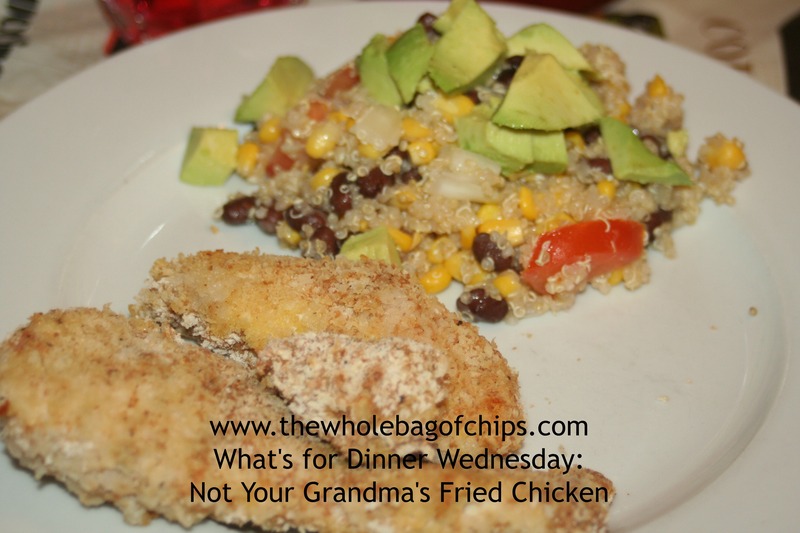 With the added spices and Panko bread crumbs, this chicken was a huge hit! Ever think you just can’t do one more original thing with chicken? Ever feel like you have just done it all and can’t look at another piece of boneless, skinless chicken? But then, a wonderful thing happened! I got a surprise goodie bag in the mail from SheKnows, the company I’ve been working with lately, and they saved my dinner that day. Inside my box was a new cookbook, “Chop Chop: The Kids’ Guide to Cooking Real Food with Your Family.” Elizabeth receives Chop Chop, the magazine, from a birthday gift she got this summer, so we were *very* excited to see this newest addition to our cookbook collection. Now I happen to really like my Grandma Rose’s fried chicken cutlets, but I gave this recipe a second look. It called for Panko bread crumbs, which I had, but it also called for Dijon mustard and thyme in the recipe. Most importantly, it gave a tip which I wanted to try out: It said that refrigerating the chicken after it’d been coated with the egg mixture and the bread crumbs for at least 30 minutes, would help to keep the coating on the chicken. I love breaded chicken and I hate leaving the breading in the pan and eating naked chicken for dinner, don’t you? For that reason alone, I decided to try this recipe out that night, and I’m so glad I did! The flavor with the added mustard and thyme was delicious and the tip about the refrigeration really did work! Everyone at this, all five of us gave it a thumbs up. That type of five out of five rating is rare in this house! I served this dish with one of our favorite side dishes from our dinner at the White House: Quinoa Corn and Black Bean Salad. You can click on it to get the recipe. I found the recipe online, and I have put the link to it here, but I found it interesting that the online version from the magazine doesn’t have the refrigeration tip. It was in the cookbook though and I wouldn’t do breaded chicken without it from here on in! Here’s the recipe from the online version, with their cookbook’s refrigeration tip added in. With the help of your adult, turn the oven on and set it to 400 degrees. Pour the oil on the baking sheet and, using your clean hands or a paper towel, spread it around. Put the bread crumbs, flour, salt and pepper, and, cayenne (if you like it) on a large plate. Mix well. Crack the eggs into a bowl (throw the shells away). Add the mustard and thyme and mix well. Add the chicken pieces and swish them around until they are well coated with the egg mixture. Remove the chicken pieces, one at a time, from the egg mixture and let any extra egg mixture drip off. Dip the chicken pieces, one at a time, in the bread crumb mixture, rolling them and pressing down to coat each side. With the help of your adult, put the baking sheet in the oven and bake for 15 minutes. Using a spatula or tongs, turn the chicken pieces over and bake until golden brown, 15–20 more minutes. Serve right away, with a quarter of a lemon on each plate. Shake off any extra coating, then put the chicken pieces on the baking sheet.